The Canadian Conservative Party leader was forced into criticising one of his MPs last night after he went on a rant against 'extreme diversity' and 'identity politics'. "Children of diverse backgrounds across Canada pick up on these messages. Right now, they need to hear that their country wants more of themselves, not less," Singh tweeted yesterday. A storm around Bernier's comments forced the Conservative leader Andrew Scheer to repudiate them. For many Canadians the tweets by Maxime Bernier MP were a worrying sign the Conservative Party was testing Trumpism in their country. Earlier in the week, the MP tweeted: "Trudeau keeps pushing his 'diversity is our strength' slogan. Yes, Canada is a huge and diverse country. This diversity is part of us and should be celebrated. But where do we draw the line?" "Trudeau’s extreme multiculturalism and cult of diversity will divide us into little tribes that have less and less in common, apart from their dependence on government in Ottawa. These tribes become political clienteles to be bought with taxpayers $ and special privileges," he added. He also tweeted: "More diversity will not be our strength, it will destroy what has made us such a great country." Those comments were widely interpreted as an attack on minorities in Canada and criticised and ridiculed. But despite widespread criticism, Bernier carried on. 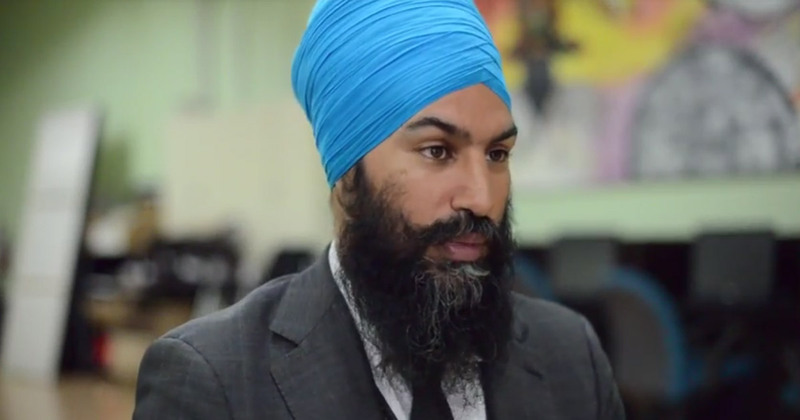 This prompted a forceful response from Jagmeet Singh yesterday. When you are told by some that Canada wants less of you, I understand the isolation you feel. I understand the uncertainty, risk, vulnerability and pain it creates. Comments like these make you feel like there's something wrong with you, for just being you. In a time when the voices against diversity are getting stronger, we must do more to embrace and empower the voiceless. More diversity will not destroy what it means to be Canadian – it is foundational to who we are, it is a fundamental Canadian value. Diversity is the fisherman in Prince Edward County passing his business onto a young refugee. Diversity is the response we saw from people in Quebec City following the mosque shooting. Diversity is knowing that beyond Indigenous Peoples, all Canadians are immigrants. I'm deeply disappointed in @AndrewScheer. His refusal to denounce these divisive comments sends a dangerous message. Children of diverse backgrounds across Canada pick up on these messages. Right now, they need to hear that their country wants more of themselves, not less. Liberal MPs such as Arif Virani also chimed in. Prime Minister Justin Trudeau stayed away from the topic. Last night Scheer issued a condemnation but sources within the party told Global News his slow response made him look "weak". Andrew Scheer said in response: "Maxime Bernier holds no official role in caucus and does not speak for the Conservative Party of Canada on any issue." He added that a Conservative government would continue to welcome immigrants and stressed the need to "ensure that Canada continues to be a place where people from all over the world can come to find a richer, freer more peaceful life." So far that has a put a lid on the furore. But it won't be the last time this debate surfaces.